Before we left for Southeast Asia, we joined a house-sitting website. As Joe was scrolling through the site looking at various offers, what to our wondering eyes should appear but an ad from a veterinarian looking for house-sitters in Chiang Mai for 10 days in December. We contacted her, had a quick Skype date, and voila! Here we are living on the outskirts of Chiang Mai looking after her house and two darling dogs. We are loving this city. So much to do. So much to see. So much to eat. So much of everything. 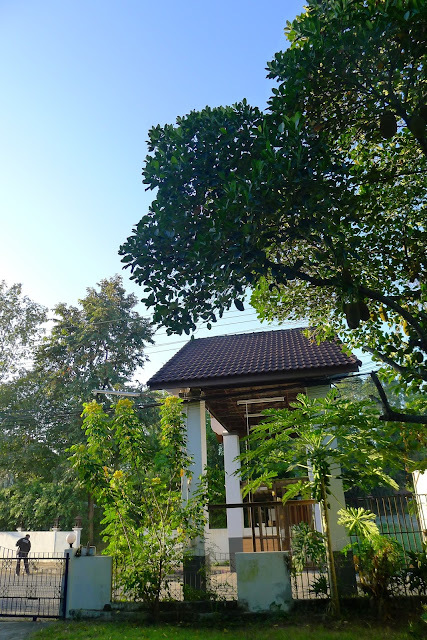 The house we're staying in is about a 10 minute drive from the city of Chiang Mai. It is very peaceful here. Very quiet and lush. Uber is our new BFF. We call for a car at least twice a day to take us to and from the city. The 'Good Vibes Cafe' is directly across the road from the house. Great food with a beautiful garden. Every evening we take Mango for a walk around the neighbourhood. The food in this city is unbelievable. We stop to eat as often as our stomachs will allow. Khao Soi is our newest favourite dish. 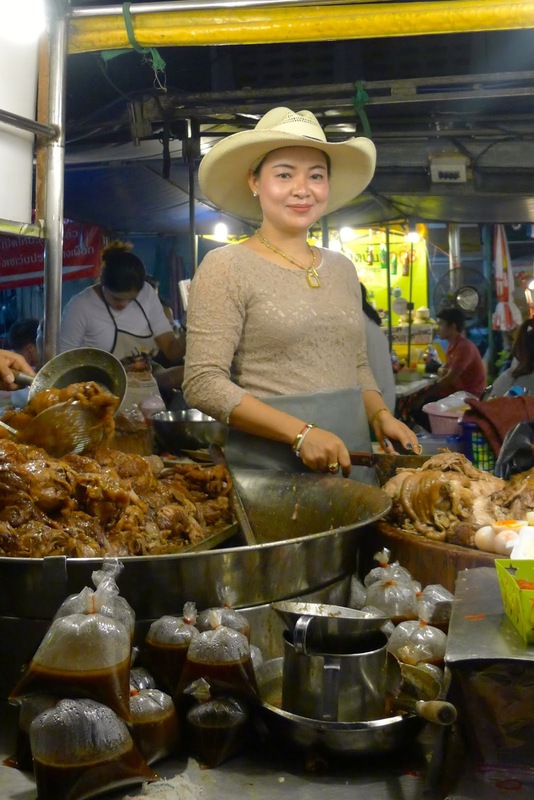 The elegant Cowboy Hat Lady serving up stewed pork in her food stall. Food vendors are everywhere at night. A Squamish friend connected us with his Thai friend Annie. We met Annie for dinner one night along with her boyfriend and his parents. Her French boyfriend's parents were visiting from Paris. We had an incredible evening with this great group of people. We hired a guide to take us up into the mountains to visit some temples and waterfalls. Jack was a wonderful guide. Smart, funny and knowledgeable. Just the kind of person you want to spend a day with. 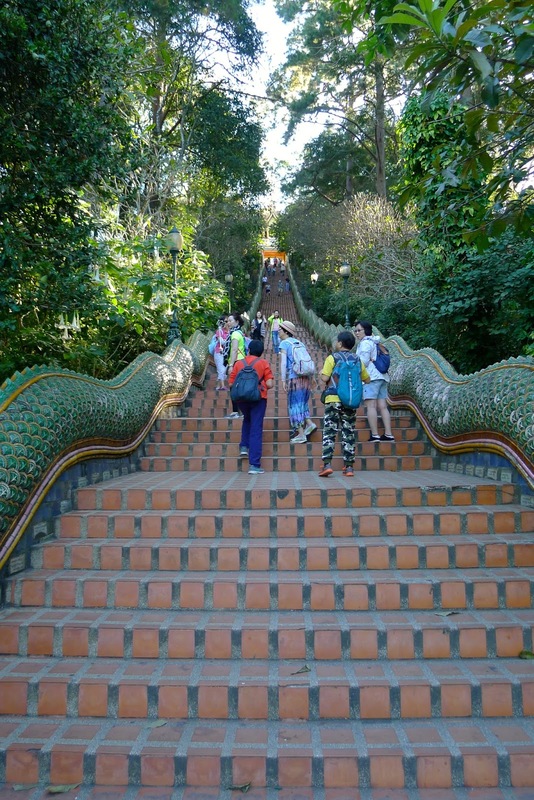 The walk to Wat Phra That Doi Suthep is a steep climb up a very long set of stairs. It is crazy to think how this temple was built hundreds of years ago on the top of a mountain. 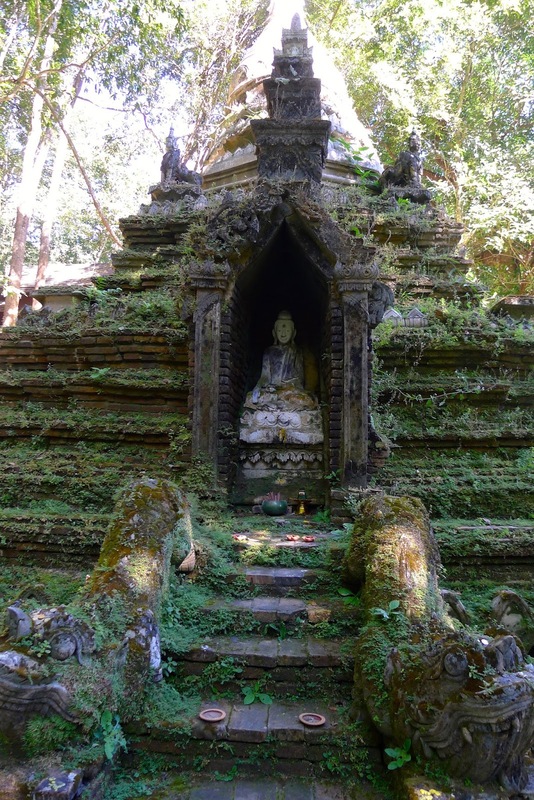 Our next stop was Wat Pha Lat, a temple built into the side of the mountain. The cool forest air was a welcome reprieve from the heat of the city. Statue detail at Wat Pha Lat. A view of Chiang Mai in the distance. 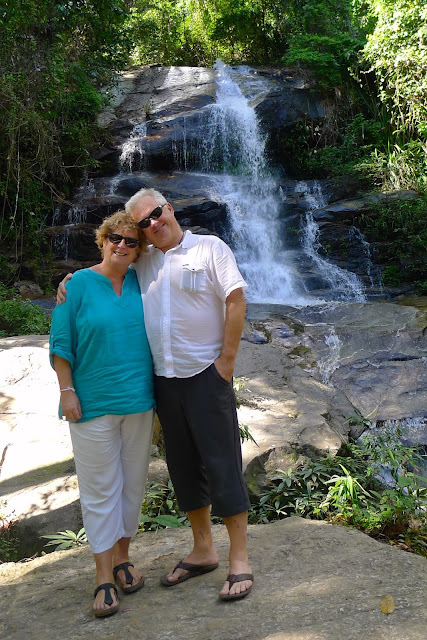 Photo op at Mon Tha Than waterfall. It is hard to believe we left Canada a week ago. We have one more week of house-sitting in Chiang Mai and then we'll be on our way. But on our way to where? 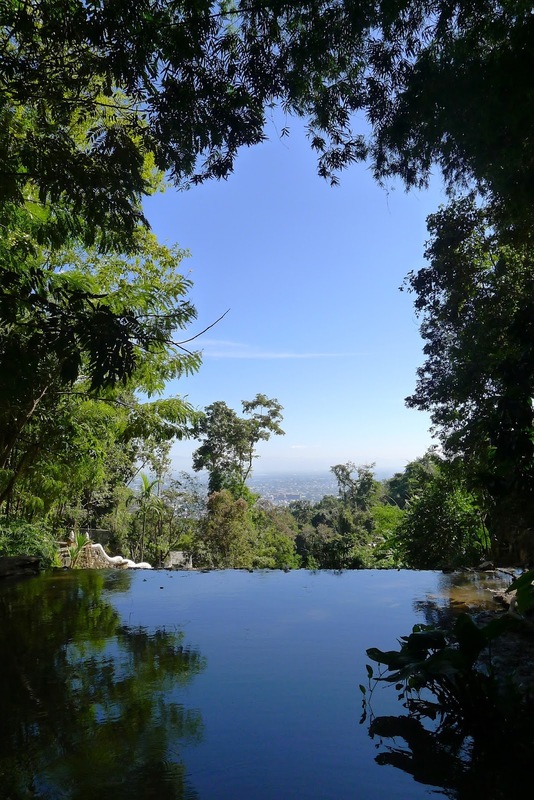 To see more of Northern Thailand? Cross the border into Laos? At this point we're not sure. We're just a couple of geriatric gypsies. And it feels so good. Thanks, Mom and Dad! 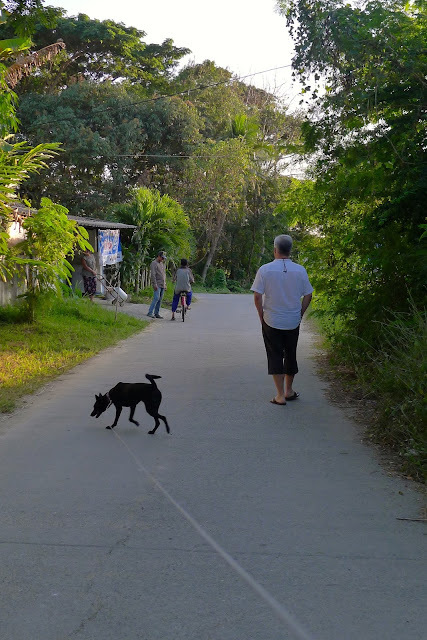 There are thousands of stray cats and dogs here in Thailand. All roaming the streets looking for food. We are going to an elephant sanctuary on January 5th when we are in Laos. We loved using Uber when we were in Chiang Mai. Each driver uses his/her own car. The cars were all new and very clean. A 20 minute Uber ride cost about $5.00 Cdn. Super inexpensive. Now we are in Pai and loving it. Really quiet and it has a laid back vibe. Amazing photos! And food! andandand!